Author: Eon Jui Lee, Vasilis Archontis, Alan Hood at the University of St Andrews. Solar jets have been observed at various wavelengths (e.g. Hα , EUV and X-ray ). They occur in emerging flux regions (EFR) , active regions , coronal holes  etc. Recently a dichotomy of jets was suggested by . About two thirds of the observed jets fit the “standard” reconnection picture, which invokes reconnection between oppositely directed magnetic fields, e.g. an emerging and a pre-existing magnetic field . The remaining one third has been named “blowout” jets, which are triggered by an eruption. More precisely, it has been observed [5,7,8] that the precursor of a “blowout” jet, is a twisted and/or a sheared arch, which often carries a (small) filament or flux rope within it. When this structure becomes unstable and erupts, it blows out the envelope field producing an untwisting ejection of cool (e.g. chromospheric) and hot material. This “blowout” jet is a broad, curtain-like structure, as opposed to the “standard” jets which are more elongated and not commonly associated with the eruption of cool material. In this nugget, we report on the emission of a “blowout” jet in an EFR with a sea-serpent configuration. We show that the “blowout” jet is untwisting during its ejection and, for the first time, we provide direct evidence of propagating torsional Alfvén waves during the emission of the “blowout” jets. We use the Lare3D code, which solves the 3D time-dependent, resistive, compressible MHD equations, to simulate the emergence of a flux tube into a stratified solar atmosphere. The atmosphere consists of a sub-photospheric layer, an isothermal layer mimicking the photosphere/chromosphere, a thin layer representing the transition region and another isothermal layer representing the corona. The flux tube, which is twisted and marginally stable to the kink instability, is initially placed under the photosphere. A density deficit is introduced in the flux tube, making two parts of the tube more buoyant than the rest, resulting in the formation of two bipolar regions when flux tube emerges through the photosphere. The corona has an oblique ambient field, which is anti-parallel to the flux tube, and is relatively weak compared to the flux tube. Figure 1: Temperature & density (magnetic field direction overplotted as arrows) distribution across the jet in the middle of a bipolar region, before (top) and during (bottom) the ejection of the blowout jet. Figure 1 shows the temperature (left) & density (right) distribution across the jet in the middle of a bipolar region during the first eruptive event. The top panel shows the distribution just before the blowout jet. We find a rising motion of the cool, erupting material towards the interface between the emerging field and the ambient field, which then leads to more external reconnection between the two magnetic flux systems (the erupting field and the ambient field) and the onset of a hot and fast reconnection jet. The bottom panel shows the distribution when the blowout jet is ejected and the dense erupting material is emitted along the reconnected field lines of the ambient field. Both the external arcade and the jet channel are wider, and an internal arcade is now formed due to the internal reconnection. Figure 2: (a): 3D visualization of magnetic field lines. (b): product of the components of the current and vorticity parallel to the magnetic field. 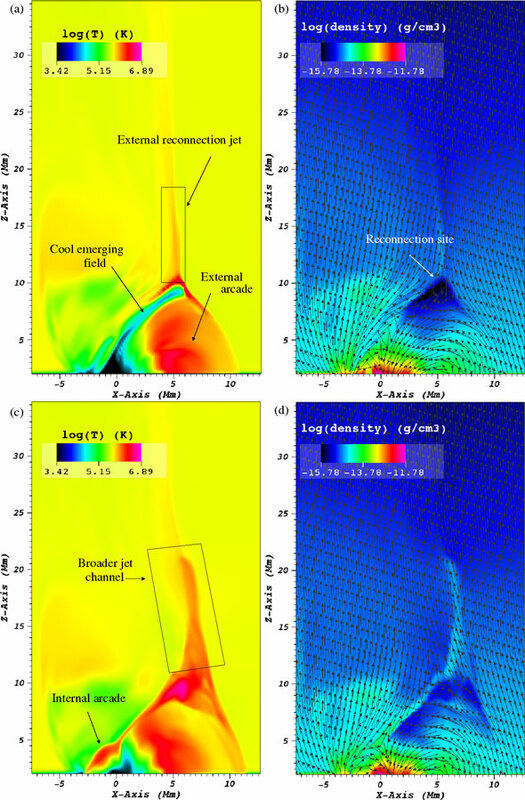 The 3D visualization of the magnetic field lines within and around the first blowout jet is shown in Figure 2a. The yellow field lines show that the magnetic field along the blowout jet is twisted. The reconnection of this erupting field with the open ambient field would relax the twist and lead to an untwisting motion, thus resulting in a helical blowout jet. The blue field lines are the reconnected field lines from the previous reconnection jets. Figure 2b shows the product of the components of the current and vorticity parallel to the magnetic field. This product is mainly negative within the jet channel, indicating that the current (∇xB) and the vorticity (∇xv) are pointing in different directions. The direction of the magnetic field (B) is opposite to the direction of the flow (v), and agrees with the untwisting of a twisted magnetic field. Figure 3: The distance-time diagram of ∫ ρ² dy for temperatures between 600,000 K and 1,200,000 K at (a) 17 Mm, (b) 21.5 Mm, (c) 25 Mm. (d,e,f) show the running difference of (a,b,c) respectively. (g) shows the height-time profile of the leading edge of the jet. (h) shows the speed of the edge (solid line) and the local Alfvén speed (dashed line). To study the plasma motion of the blowout jet, we calculate I = ∫ ρ² dy for temperatures between 600,000 K and 1,200,000 K at various heights. By plotting I as a function of time, we then obtain the evolution of the transverse motion of the jet with time. Figure 3a,b,c show the intensity, I, plotted at three different heights, (a) 17 Mm, (b) 21.5 Mm and (c) 25 Mm. We find that the jet is moving firstly towards the positive x direction, then towards the negative x direction, and finally back towards the positive x direction, in an oscillatory manner. The intensity oscillation propagates from lower heights (fig 3a) to higher heights (fig 3c). Since the jet is travelling along the pre-existing ambient magnetic field, this is clear evidence of a wave propagating towards the outer solar atmosphere. To investigate the propagating wave in more detail, we plot the running difference of intensity, as a function of time, in Figure 3d,e,f. The white cross indicates the first local maximum (along time) in each running difference plot, which corresponds to the first significant increase of plasma density at that height. It is likely that this point is located at the leading edge of the jet. The height-time profile of this point is then plotted in Figure 3g, and, by calculating its gradient, we obtain the propagation speed of the wave. This is shown as the solid line in Figure 3h. The wave speed (solid line in Figure 3h) is comparable to the local Alfvén speed (dashed line in Figure 3h). Given that there is an untwisting motion along the jet and that the wave speed is comparable to the local Alfvén speed, these suggest that we are witnessing the propagation of a torsional Alfvén wave during the untwisting motion of the blowout jet. In this nugget, we have shown the onset of blowout jet in an EFR, consisting of two bipolar regions. In fact, we have found recurrent onset of blowout jets throughout the simulation. The jets have velocities of 100~250 km/s and they transfer dense plasma into the outer solar atmosphere. The reconnection of the erupting field and the ambient magnetic field results in an untwisting motion. In addition, for the first time, we provide direct evidence that the untwisting motion of the blowout jets is associated with the propagation of torsional Alfvén waves in the corona. See  for more details.